Make the right choice for your next renovation project when you shop with us for your laminate flooring. At our showroom, we feature a full selection of product options for homes and businesses. When you are looking for an affordable way to upgrade your space, choose our store for your flooring purchase. We proudly offer a complete collection of designs that fit any budget. No matter what your personal style preferences are, we have something to fit every space in your home. Shop with us to explore our designs and create a beautiful appearance that will last for years to come. Laminate wood flooring offers a luxurious look for an incredibly low price. Laminate wood floors are one of our most affordable options, as well as a customer favorite because they are well known for saving our customers hundreds or even thousands of dollars. Laminate tile flooring is an inexpensive option and offers easy installation for homeowners. Looking for laminate wood flooring to complement your home décor? Your journey starts at our flooring showroom. We offer a broad selection of laminate wood flooring that's both visually appealing and highly functional. Laminate offers the durability and multidimensional textures you want to elevate the elegance of your residential haven. Laminate flooring strikes an appealing balance with durability, good looks, and value pricing that allows you to expand your decorating ideas without increasing your budget or sacrificing quality. The stunning design you choose now has the lasting power to withstand heavy foot traffic and daily use. Laminate floors are engineered in four layers to provide homeowners with the dependability and aesthetics they seek. Each layer plays a pivotal role in protecting the integrity of your floors. Our wide selection of laminate floors is updated every season to make sure that you will have the most diverse options and new styles to choose from. Laminate flooring is versatile in a number of ways. It is laid down on a durable core-board that can endure up to 1,200 pounds of pressure per square inch. In addition to that durability, you have numerous options to choose from once you’ve decided on laminate flooring. You can choose from high-resolution patterns that imitate specific species of trees and come in multiple textures. With laminate floors you save not just money, but time as well. Installing this flooring option is simple. Special glues and other adhesives are not necessary, since the tongue-and-groove pieces literally snap into place. And because laminate floors don’t need to be nailed or glued down, the composition of your sub floor doesn’t matter. Your new flooring can be laid on top of concrete, plywood, wood, or even existing vinyl flooring. Laminate floors can even be laid over concrete slabs. Once you’ve installed your new flooring, maintenance is easy. You won’t need any special tools or cleaning products, nor will you need wax or polish. A routine dusting or vacuuming is all that you need to do, followed by a wipe down with a damp cloth or a mop. With laminate wood flooring, you can protect both yourself and the Earth. Because this type of flooring is simple to maintain and doesn’t absorb dust like a rug, it’s the ideal option for people who are suffering from allergies. The plastic exterior and the airtight locking system means that it is very effective at blocking moisture out. It doesn’t contract or expand in response to weather changes, which is another effective to moisture, and if it is damaged, it is easily replaced. What distinguishes our team from other laminate flooring stores? We offer clients an impressive selection of laminate in a broad spectrum of hues and designs at an affordable rate. 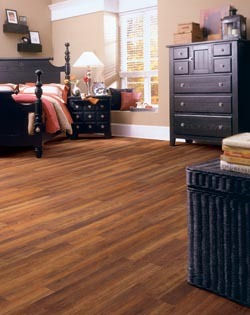 Our reputable flooring company stays competitive by maintaining excellent buying power in the market. This network of buying power allows us to offer you quality laminate at a price you won't believe! Discover the possibilities today for all your flooring projects. Stop by one of our 500 locations nationwide and peruse our selection of quality laminate floors! Here you will find laminate floors that work in virtually every room of your home. Instead of spending time and resources looking for a qualified installer, take advantage of the expert laminate flooring installation from our experienced team of installers. Our flooring contractors have the skills and experience to properly install every piece of laminate tile in your home. Your laminate flooring installation will be done right the first time when you rely on our flooring experts to install the product of your choice. Contact us today at <PHONE> to learn more about our laminate flooring and installation. We proudly serve the communities of Ankeny, Saylorville, Bondurant, Altoona, and Elkhart, Iowa.